1970, June 17: Land-Rover caused a stir by releasing the Range Rover with a 3.5-litre alloy V8 engine, coil spring suspension, load levelling, disc brakes and full-time four wheel drive, all for £1,998. There were waiting lists to buy Range Rovers which could be immediately resold for more than the factory charged. 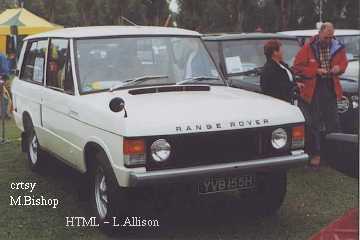 A pre-production Range Rover, YVB155H, at Billing. 1971-1972: The British Trans-Americas Range Rover expedition. The Darien Gap was the most difficult section. 1973: Power Steering was added. 1979: A modified Range Rover driven by Alain Genestier and Joseph Terbiaut won the first Paris-Dakar rally (another won in 1981) -- LR. 1981: A 4-door Range Rover was introduced. 1982: Land-Rover offered an automatic transmission option, although specialist firms had been performing conversions for some time. 1983: A 5-speed manual gearbox was introduced. 1985: The V8 engine got fuel injection. 1986: A 2.4-litre VM diesel was offered as an alternative to the thirsty petrol V8. This was aimed at the European market where fuel is expensive. 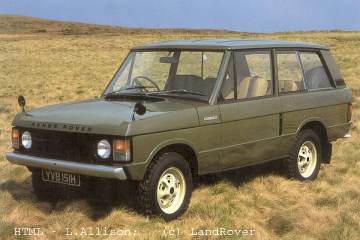 1987: Land-Rover reentered the North American market. 1988: The Vogue SE model was introduced. 1989: The petrol V8 grew to 3.9-litres (the VM diesel to 2.5-litres in 1990). 1992: A new transfer case was introduced, using a Morse (silent) chain (instead of three gears) and with a viscous coupling on the centre differential. 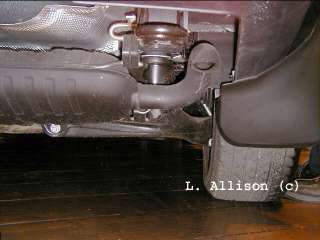 Air-bag suspension became an option on the top models. A 108" long wheelbase model was added which gave a much better look under four doors. A 4.2-litre V8 became available. Land-Rover's 200 Tdi diesel replaced the VM unit. 1994: An all new Range Rover (P38a) was released, although the old model continued to be made as the 'Range Rover Classic' until February 1996 by which time 317,615 had been built. 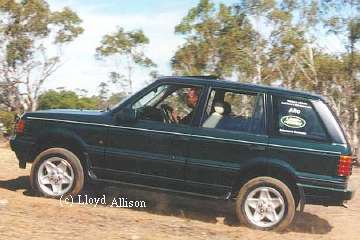 1994: The new Range Rover (P38a) was released in the U.K., and in Australia in 1995; 1995 was the 25th anniversary of the first Range Rover. The new body was bigger and more rounded but with many hints at the original shape. Underneath, the separate chassis had been redesigned for improved crash-worthiness, air-bag suspension became standard so the the rear A-frame was made redundant and rear axle location was pereformed by "composite" radius arms. The new car still had live axles, but the front ones now had "open" steering swivels. The V8 petrol engine was offered it 4.0 and 4.6-litre (nominal) capacities, driving either Rover's R380 5-speed manual gearbox or a ZF 4-speed automatic gearbox. The ZF unit had lock-up abilities for starting on loose surfaces. 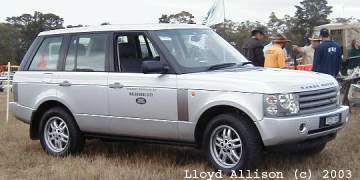 2000 prices: Range Rover 4.0 S $79,950, Range Rover 4.6 HSE $119,950 ($au 2000). 2001 prices: 4.0 S V8 auto $85,937, 4.6 HSE V8 auto $115,940, 4.6 Vogue V8 auto' $130,991 ($au 3/2001). Rivals: BMW X5, Mercedes-Benz M-class. 2001 December: A total of 167,259 Range Rover IIs were built. 2001 September: Production began at Solihull. 2002 January: The Range Rover III (L322) premiered at the North American International Auto Show, Detroit, and also appeared at the Melbourne Motor Show, February 2002. On sale in Australia in June 2002. The third Range Rover was designed when LandRover was owned by BMW but released after Ford bought the company. It has a 5-speed automatic gearbox, 2-speed transfer case, full-time four-wheel drive, height-adjustable independent suspension front & rear with air-springs, and is powered by BMW's 4.4-litre petrol V8 4-valves/cyl' (210kW), or 3.0-litre turbo-diesel 6-cylinder (130kW) engines. 2003: The Range Rover will lift a wheel about 5" earlier than a Defender LWB, but traction control usually keeps things moving. 2005: Petrol engines changed to Ford (Jaguar based) 4.2L V8s, naturally aspirated (225kW, 440Nm), and supercharged (291kW, 560Nm), with a ZF 6-speed automatic gearbox. The BMW diesel with 5-speed auto continues, for a time. uk list price £49.5K-£64.5K (on road £57.5K-£74.9K), 2/2009. 2009, 2010 model year (10MY), on sale late 2009 in .au: previous 3.6-litre TDV8 engine continues, new 5.0-litre V8 petrol and supercharged petrol engines. 2010, November 4: The one millionth Range Rover to be built since 1970 was doneated to the charity 'Help for Heroes'. 5-litre supercharged petrol, 375kW, 625Nm. 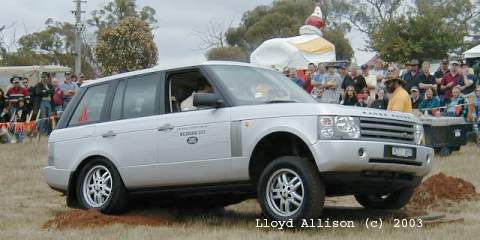 8-speed auto, full-time 4WD, centre diff..
From au$169K+ to au$240K 'Autobiography' (11/2012). Free: Linux, Ubuntu operating-sys, OpenOffice office-suite, The GIMP ~photoshop, Firefox web-browser, FlashBlock flash on/off.